Chic, trendy, sporty, bohemian, sophisticated, fun, classic — you probably have a clear vision of your fashion and style personality. But do you know your laundry personality? How you wash the clothes you wear is every bit as personal and unique to you as the clothes themselves. Knowing your laundry personality could help ease the load and make the chore easy and fail-proof. Does your desire to separate and preserve clothes, including those delicate special care items, ever leave you with the only option of running the washer with just one or two items? You’re not alone. 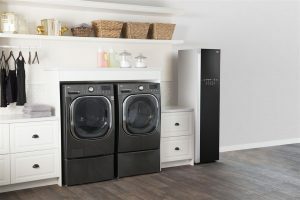 According to a recent survey commissioned by LG Electronics, 60 percent of Americans admitted to running a full load of laundry for six items or less. The LG TWINWash system will put an end to that, letting consumers tackle two loads of laundry at once, or independently. The industry-first two-in-one washing machine includes a front-load washer ergonomically placed on the top for larger loads, and a smaller washer, the LG Sidekick, which sits on the pedestal for those small specialty loads. The LG SideKick provides an additional 1-foot capacity and has six cycles to choose from: normal, intimates, hand wash, activewear, rinse + spin and tub clean, allowing consumers to wash those smaller loads, saving time and energy. Does the thought of washing dark jeans and a pink blouse in the same load leave you light-headed? You and 20 percent of Americans prefer to avoid mixing items of different colors in the same load. Some of those surveyed also don’t trust washing items like delicates (52 percent), jackets (49 percent) and blouses (30 percent) in the main wash. Facilitate your separation efforts by using multiple baskets or hampers in your laundry room. Label them — darks, whites, delicates, workout, etc. — and encourage family members to drop their dirty clothes in the appropriate basket. For items not trusted for the main wash, the LG SideKick, part of the TWINWash system, can help tackle smaller loads, ensuring they’re properly washed by one of the six cycles. Do you do minimal separation? You’re joined by a majority of Americans that load up their washer. A recent survey concluded that 80 percent of Americans have purposely overloaded their washer to avoid doing the second load of laundry. Plus, 22 percent of Americans have deemed clothes not properly cleaned because of an overloaded washer. High-efficiency front-load washing machines alleviate both of these problems. Unlike traditional top-load washing machines with agitators, front-load washers offer greater capacity while using much less water, which actually cleans clothes better! It’s a myth that more water equals cleaner clothes. Plus, they have faster spin speeds than their top-load counterparts, which means your clothes come out the dryer, saving you time and energy when drying your clothes. Use color-safe detergent and cold water for every load of colors. With today’s super-efficient detergents and better washing machines, you don’t need hot or even warm water to get clothes clean; cold will work just fine and will reduce the chance of colors fading or bleeding into each other. Summer is a busy — and sticky — time, running from work to outdoor barbecues during the hottest months of the year. And refreshing that summer wardrobe between pool parties is key to the habitual dry cleaner looking and feeling their best. That’s where the LG Styler comes in. The LG Styler is a fashion-forward, one-of-a-kind clothing management system that can refresh and sanitize clothing in as little as 20 minutes. Just get back from an outdoor cocktail party? Simply place your favorite dresses, shirts or suits inside and let LG’s TrueSteam technology work its magic to reduce wrinkles and odors from things like sweat or smoke, without any harsh chemicals. While it doesn’t replace dry cleaning, it can certainly help reduce trips to the cleaners while keeping your clothes crisp and ready to go before your next brunch date or happy hour. Whatever your laundry personality, you can find a washer, dryer, and detergent that will make your chore easier and less time-consuming. Then, you can spend that time on other things. In fact, Americans surveyed say if they could cut their laundry time in half, they’d spend that extra time hanging out with their kids, watching TV or doing other things they enjoy.